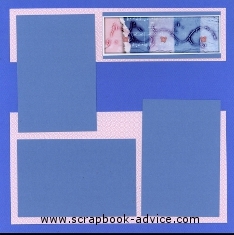 Here are some more suggestions for Baby Scrapbook Layouts for giving a Baby Shower Scrapbook and some Gift Album Tips. These layouts have no photos as the mother will be adding them herself, so the mattes are all sized for 4 x 6 photos and a couple of 5 x 7 photos. I always use standard sized photos so the new mom will not have to trim photos to fit the mattes. 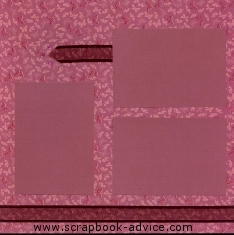 The background paper for these Baby Scrapbook Layouts is a Pink with Pink Felted Words that I picked up at A. C. Moore - no name on it. The hand and foot print embellishments were from Jolee's. The photo matte and title strip and the side journaling box will have the baby's name, first photo and particulars about the birth - date, time, weight, length, etc. Since this is a Baby Shower Scrapbook, I am leaving that for the mother or father to write in their own handwriting and since she is not from the US, she may want to write it in her own language, which I don't want to attempt. Or, maybe write the journaling in both languages. 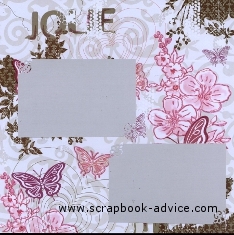 The photo matte, title and journaling box were punched on the edges with the Martha Stewart Around the Page Punch Set called Scroll Lace. The side journaling box was also decorated with tiny glitter hearts from my stash and colored in shades of pinks and purples with my Copic Narkers. Baby Scrapbook Page using Wedding Favors. Paper: SEI Paper Pack "Chocolat" picked up at A. C. Moore. It is a beautiful paper with tiny glittery butterflies all over and looks much better in real life as the glitter does not scan well. The Embellishment for these Baby Scrapbook Layouts is a wedding favor from the couple currently expecting this baby. The mother-to-be had given me the favor months ago and I am sure she is not expecting it to be in her scrapbook. But, in this case I think it appropriate to have a page with the parents. 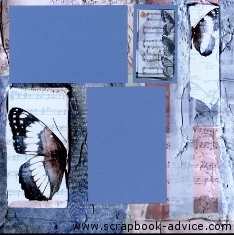 A great way to start the Family Tree Scrapbook Layouts - and it is at the beginning of the book. I embellished by adding pink jewels at the ends of each of the ribbon ties and around the corner of the upper photo matte. The Burgundy Ribbon was found to match the color of ribbon on the wedding favor and used to accent both layouts. Paper: SEI Paper Pack "Chocolat". 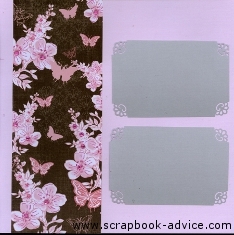 These Baby Scrapbook Layouts use a printed background paper of pink roses and butterflies on chocolate brown.It was cut in a wavy manner around the flowers in the print with each half adhered over the pink background. Photo mattes were pink from the Paper Pack and Ivory and were inked on the edges with Tim Holtz Distress Ink in Vintage Photo to make them stand out from the background. I further embellished the designs on the printed paper with my pink Copic Glitter Spica Marker . 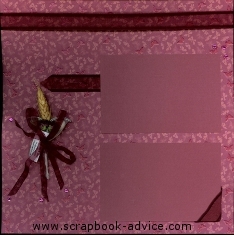 Brown Ribbon from my stash was used to accent the upper journaling box on the on the left page and the pink strip on the right hand page. Paper: SEI Paper pack "Chocolat 48 sheets with 6 litter papers, 6 foil papers, 20 patterned papers and 16 solid textured papers that I use forphoto mattes. 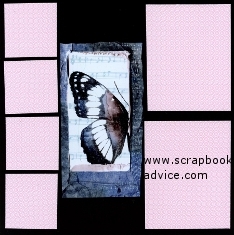 These papers were primarily pink with a lot of browns and some greys - and lots of butterflies. 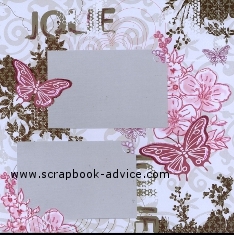 Perfect for a Baby Shower Scrapbook for a Girl. The Background was one of the Glitter Papers. 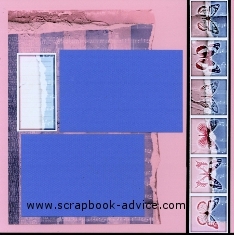 Mattes were punched on the opposite corners with Martha Stewart Corner Punch from the Around the Page set called Scroll Lace. 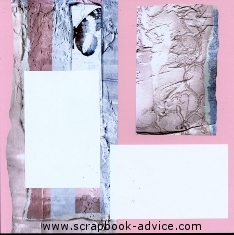 Photo Mattes on the left page were inserted behind part of the page design that was cut out with a craft knife and scissors. Paper from Best Occasions "Bright Punch Out Pack" from Walmart which came with 40 subtle patterned papers and alpha and accent punch outs to match. 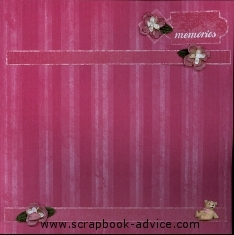 Four of the punch outs were used on the left hand page with Silk Flowers and Leaves added tothe strips and the square tag on point at the Memories Tag. Also added was the little Acrylic Bear on the bottom of the page from my stash. The right page has a frame made from white card stock that is just big enough to slide under it a 6 x 4 photo. 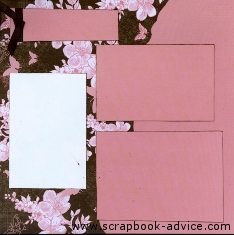 Scrapbook-advice.com Gift Album Tip: Each of the corners is decorated with various Pink and White Silk Flowers and leaves cut from a stem of flowers. 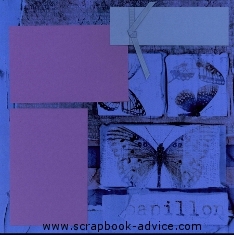 These next 10 Baby Scrapbook Layouts were all done using a Special Kit from Club Scrap.com They Kit for July 2011 was called "Papillon" - this was a version of it in pastels. 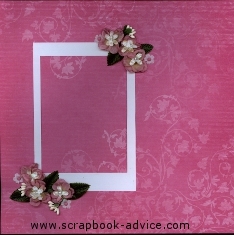 Perfect for a New Baby or a Baby Shower Scrapbook. The layouts were done from and Assembly Line Scrapbooking that Club Scrap calls ALSB. When you purchase the kit, the provide you with some sample layouts. I like to use these layouts, but I don't always complete them in the exact pattern that Club Scrap provides. But they are wonderful to have to get started with. Paper SEI Paper Pack "Chocolat". 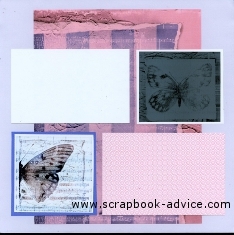 The printed background paper of pink roses and butterflies used on a previous page was used here again for the end page. 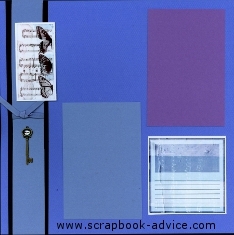 For this page, I cut a strip 5 inches wide. 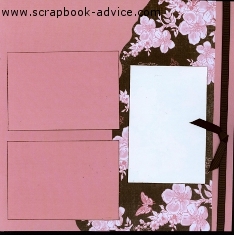 Scrapbook-advice.com Gift Album Tip: I enhanced the lines in the Roses with that Pink Copic Glitter Spica Marker. In addition, I glued on some Pink Rhinestones to the flower centers. 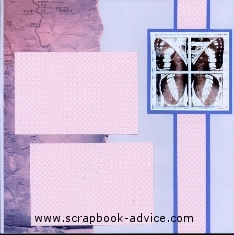 I hope you have enjoyed these Baby Scrapbook Layouts that are really a little different from the normal. 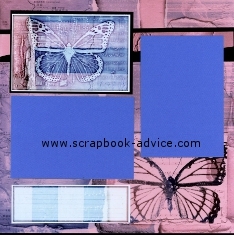 Scrapbook-Advice.com Gift Album Tip: When giving a scrapbook album to someone who is not a scrapbooker, you need to make the layouts generic so that the pictures and journaling can tell the story. Don't constrain the mother to having to have specific photos. Here she can just add photos and her comments. Whether it is photos of her before the birth, at the baby shower, from the ultrasound, first photo at the hospital, coming home or the first year milestones, these generic Baby Shower Scrapbook Layouts will cover everything.